Last month I didn't post a monthly favourites, purely because I hadn't really tried any new products and was just sticking to what I knew, which always happens for me around this time of year as i'm typically on a bit of a spending ban in the run up to Christmas. 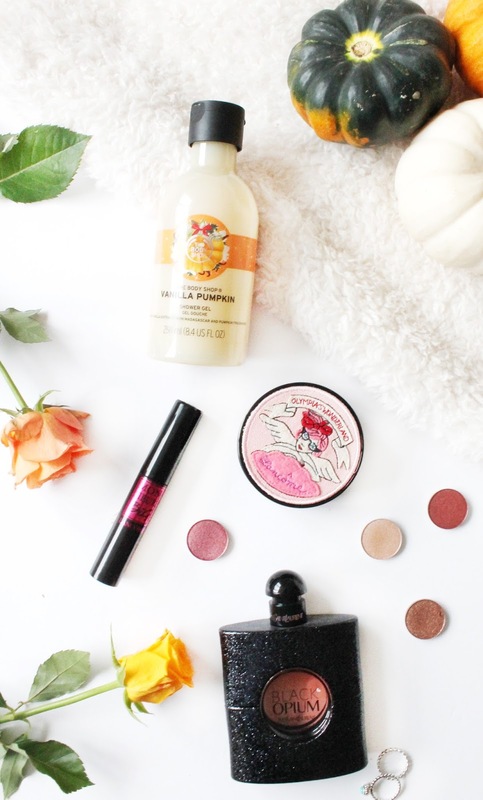 Having said that, this month i've been enjoying a few new products and I thought i'd kind of do a September and October favourites in a oner for you guys! As the weather has been changing, so has my style and also my makeup picks as i've been pulling out the more wintery scents and spicier makeup pickings, of which has been nice as it's allowed me rekindle my love for some old products, whilst enjoying some new ones as of late. The first product is one that i'm sure every blogger or just pumpkin scent lover out there has smelt, as The Body Shop have released a limited edition Vanilla Pumpkin range and being a massive fan of their shower gels I couldn't not resist picking up the Vanilla Pumpkin Shower Gel (£5) from the range. As the scent suggests this is a lovely vanilla scent with a little twist with the added pumpkin, that mixed together just work so well. I find that this isn't too overpowering as some pumpkin scented products can be, and it's super creamy which leaves my skin feeling so nourished whilst also smelling great! Another scented product that I can not get enough of at the moment is the YSL Black Opium Perfume (£50) of which i've recently rekindled my love with as i'd kind of put this away for the summer months, but now that autumn/winter is here it's time to bring it back out! If you've not tried this fragrance, then you've just got to, as it smells absolutely incredible. It's the perfect sophisticated yet feminine fragrance that has a slight mysteriousness to it that I just love, and i've been getting a lot of wear out of this recently! A couple of products from Lancome that have been getting a lot of love from me recently have been the Monsieur Big Mascara* (£21) which i've been using for about a month now and it has blown my away with how good of a mascara this is. It coats every single lash amazingly, and gives amazing volume and thickness, so much so that a lot of people think i'm wearing falsies when in fact i'm not! The other product from Lancome is from their latest collab with Olympea Le-Tan, which is a limited edition collection described to be perfect for this autumn. The product in question is their Cushion Highlighter* (£30) of which works in a similar way to their cushion foundation as you apply in a similar way but once blended out it leaves a beautiful highlight that is stunning but yet not too overpowering at the same time. I also adore the packaging of this collection as it's so fun and quirky! Finally we have some eyeshadow shades that i've really enjoyed playing around with recently, and these are from the Freedom Makeup HD Eye Foils* (£5) in the shade 'Metallic 1', which are just a beautiful mix of copper and red shimmer shades that all work so well together to give an autumnal eye look that is just stunning! Being a girl that typically sticks to golds and bronzes, i've really enjoyed stepping out of my comfort zone with these eyeshadows and i've found a whole new buzz when it comes to doing my makeup! What products have you been loving recently?